The idea of connecting the Mediterranean Sea to the Red Sea is as old as the pharaohs. The first canal in the region seems to have been dug about 1850BCE, but that attempt, like many others, failed. Desert winds blew in and clogged the canal. About 150 years ago, Great Britain had a thriving trade with India, but without a canal, British ships had to make a long journey around the entire continent of Africa in order to trade with India. A canal through the Isthmus of Suez would cut the journey from Great Britain to India by 6,000 miles. An isthmus is a narrow strip of land connecting two larger pieces of land. A French company led by Ferdinand deLesseps made a deal with Egypt to build the Suez Canal. After ten years of work, the canal opened in 1869. The Egyptian ruler, Ismail, celebrated the opening of the Suez Canal by building a huge palace in Cairo. Ismail treated royalty from around the world to a celebration in honor of the new canal. The heavy spending for the celebration came at a time when the price of Egyptian cotton plunged. 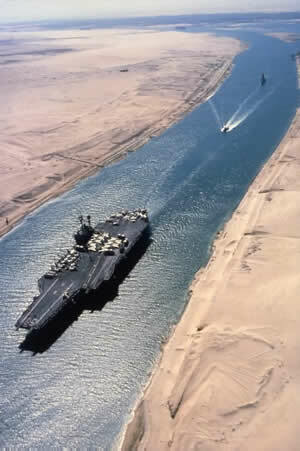 Egypt had gone into debt to pay for the Suez Canal. Ismail took out loans from European banks, but he was unable to repay the loans. Consequently, Egypt was forced to sell its share of the Suez Canal to Great Britain. The Suez Canal made it easier to trade with faraway nations. The canal also made it possible for European armies to colonize East Africa. In 1936, the British stationed soldiers along the Suez Canal in order to protect their investment. The canal became very profitable for the British, but the Egyptian people were unable to share in most of the profits. This angered many Egyptians. In 1956, Egyptian president Gamal Abdel Nasser planned to build a great dam to control the annual flooding of the Nile River. Nasser asked the United States and Great Britain for financial assistance, and when the two powerful nations refused, Nasser seized the Suez Canal and declared it to be the property of the Egyptian people. Britain, France and Israel invaded Egypt. World War Two had ended a decade earlier, but many people feared the Suez Crisis would lead to a another World War. A Third World War might be even more dangerous than the previous wars because by 1956, scientists had discovered how to use nuclear weapons. Several nations voted to authorize the United Nation to send peacekeeping forces to the Suez and to call for Britain, France and Israel to leave the region. Egypt gained control of the canal, but because of damage inflicted by the war, the waterway remained closed for many months. The Suez Can cuts the journey from Great Britain to India by 6,000 miles. 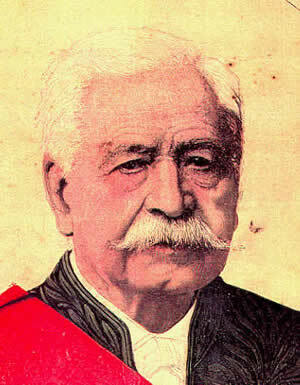 Ferdinand deLesseps (1805 – 1894) developed the Suez Canal. When completed in 1869, the Suez Canal joined the Mediterranean and Red Seas, substantially reducing sailing distances and times between the West and the East.